After you purchase an SSL certificate, and activate the SSL credit, you need to request it for the website's domain name (or "common name") you want to secure with the SSL. My website is the primary domain on a GoDaddy hosting account. Use the SSL Wizard to request your certificate for automatic installation. My website is a secondary domain hosted on a GoDaddy hosting account or is hosted with another company and I have not generated a Certificate Signing Request (CSR). Use the SSL Wizard to create a CSR and Private key that you can download for later use, and request your certificate with these files. I have a CSR and just need to request my SSL certificate (advanced users). Request a certificate with a CSR that has already been created. Note: If your website was created using Managed Wordpress, GoCentral or GoCentral Online Store, your SSL certificate is automatically installed for you when your website is created, and you can disregard these instructions. On the Certificate Setup page, click Choose a Domain. Start typing your domain name. If your domain name is the main domain on a hosting account with GoDaddy, it will be under a list called Web Hosting. Click on the domain name, and then Continue. That's it! Your next step is to prove you have control of the domain name. On the Certificate Setup page, click Choose a Domain, type in your domain name and click Continue. 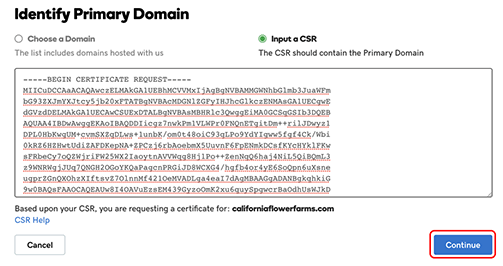 Your certificate signing request(CSR) and Private Key will appear below your domain name. Click Save File below both sections to download both your CSR and Private Key. On the Certificate Setup page, click Input a CSR. Paste your entire CSR into the box, and click Continue. Learn about how HTTPS helps protect you and your customers.